View cart “Aurelio Voltaire: Heart-Shaped Wound (CD)” has been added to your cart. 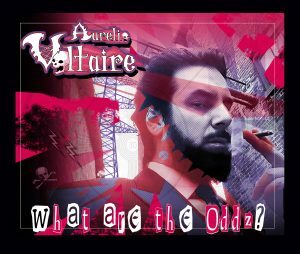 “What are the Oddz?” is largely comprised of the songs Aurelio Voltaire wrote with his 2005 “New wave” side project, The Oddz. He was very far along recording an Oddz album in 2005 but had to ultimately (and sadly) abandon the project to fulfill other responsibilities at the time, such as the recording of Ooky Spooky. He’s gotten back to the album recently, a lot of the tracks were recorded with original members, while some portion of the album has been recorded more recently. Available as a standard CD or as a 2CD bundle including 2017’s Heart-Shaped Wound CD.